There I was sitting in my recliner just knitting away while watching our St. Louis Cardinals. They were playing in Baltimore, a stadium I've been to WAY more than once. We used to live in the area before there were Washington Nationals. Loved going to watch the Orioles play ball back in the day. So anyway, there I was knitting away actually rooting against (well, sort of! Ha!) the O's when all of a sudden I actually remembered about FNSI! Thankfully it hadn't gotten very late. 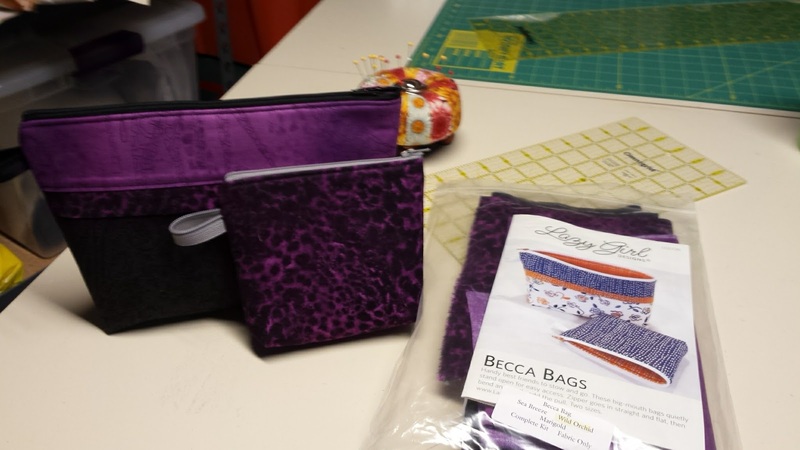 I ran downstairs to my sewing space, turned on the TV, switched over to the game, and started working again on my Becca Bags. Here's what happened ... Ta! Da! Do you see how nifty the zipper is sewn in? 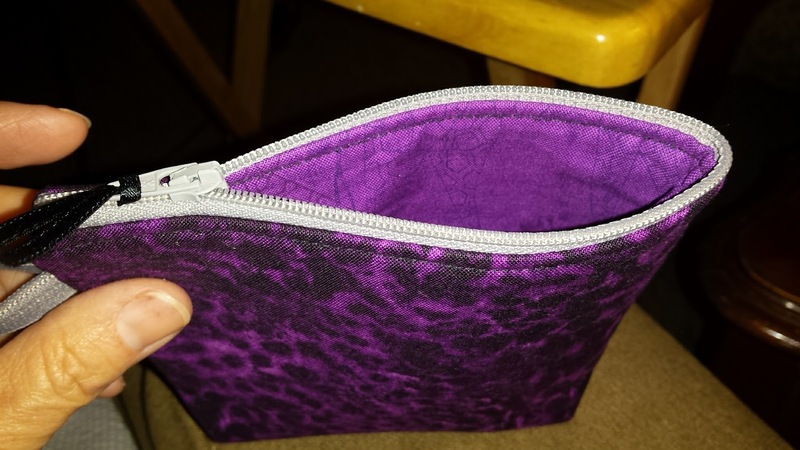 It's actually sewn in flat and then you fold your bag in half and put the zipper pull back on! Easy enough for this Quilts-Only-Quilter! I also added a little ribbon on the pull because at a retreat I was told it looked more professional! Hahaha! Yup! That's me! Pro all the way! And on this highly successful morning-after FNSI, I leave you with a couple more pictures. I would also like to thank Wendy for hosting this event. 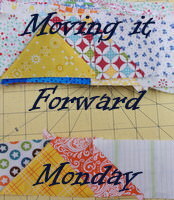 You can check out what the other quilters did last night by linking over to Sugarlane Designs HERE! You Know What Tonight Is!!! So happy today is Friday. Third Friday to be even more precise! Friday Night Sew-In!!! 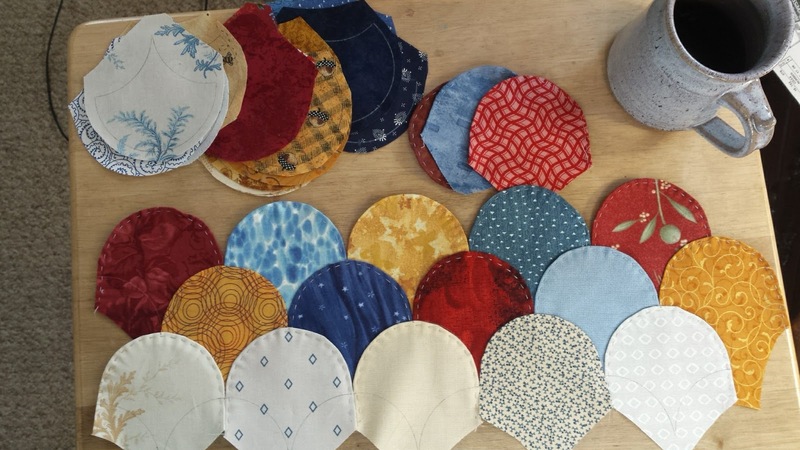 Wendy over at Sugarlane Quilts is a most gracious host of this monthly event. 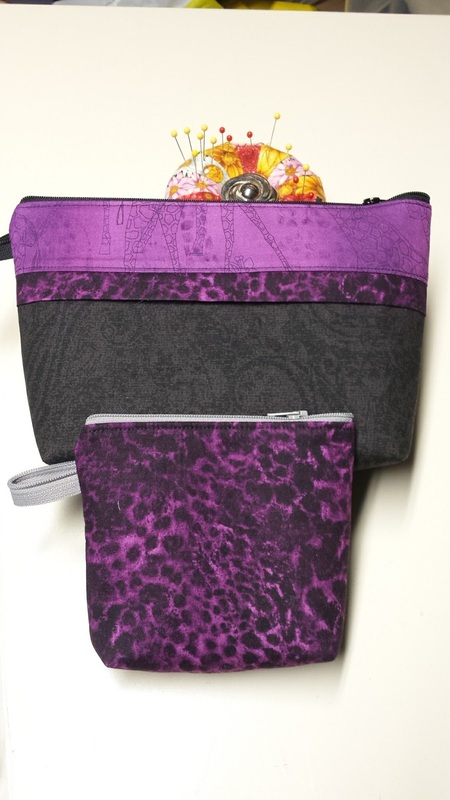 All you have to do is click HERE to sign up and party with us quilters! Party = Sew in this case. Lol! And while sewing is a lot of fun in and of itself, it's extra fun to pop on over to the party goers and see what they're working on. 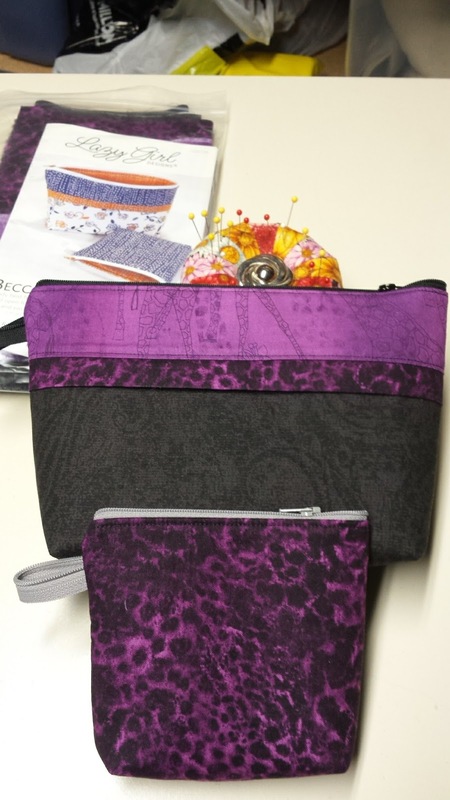 As for my own plans, I hope to finish up my Becca Bags, designed by Lazy Girl Designs. You can check the pattern out HERE. I must confess that I'm very afraid of zippers but these promise to be a snap. I bought the pattern as a kit hoping that the extra bucks spent would MAKE me actually sew these up. I've had the kit for a couple of months now and tonight is the time to break out into a sweat (not really -- remember? I said they promise to make zippers easy!) and get 'er done! Maybe, just maybe, I'll finish the bags up lickity-split and also get the chance to work on my APQ May UFO project! Yup, a little behind there! So, what will you be working on?? 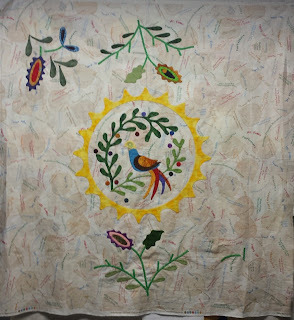 My local guild (Hearts 'n' Hands, O'Fallon IL) is having their biannual quilt show. We have over 270 quilts entered! That is mind-blowing!!! If you are in the area the weekend of June 10-11, come on out! I am sure you will be impressed. If you miss it this year, you'll have to wait until 2019! My progress for the quilt show is really good ... for me! I'm entering three quilts. Two are totally done and the third only needs its label attached! Might be a good project for today actually. I wish I could show you an updated picture of my clam shells. They are in the same PHYSICAL state as before. However, I have since formulated my plan and need to prepare the remaining fabrics and get that project going. I think Irene Blanck is amazing with this technique. I love how the Australian quilters are so focused on handwork. Anyway, stay tuned on this project because I do plan on getting back to it soon! Speaking of Irene, I've been appliqueing away on the Mosaics pattern. I would love to tell you that I'm almost done with the center medallion but not yet. However, I'm making progress and will be excited to take it to Denver later this month to show my sister. She was present when I picked out my background fabric and then, after I'd flown home, I asked her & my mother to go back to the store and pick out 1/4 yard pieces of the Jinny Beyer fabrics I had earlier eyeballed. The only direction I gave her was 3 blues, 3 reds, 3 purples, and 3 golds ... or something like that. Anyway, my sister is rather particular when she picks out her fabrics and can't believe I'm just "winging it" with their random fabrics! I keep reminding her that it's a scrappy project and it'll be just fine! Hahaha! As for the APQ 2017 UFO Challenge, May was a complete bust. I noticed Project #10 is up next for June, which cracked me up since June 10 is my daughter's birthday. That should be inspiration, right? Anyway I see that my #10 is Hugs & Kisses, designed by Gundrun Erla. I used Kansas Troubles fabrics and the top is assembled. Once again I need to get the quilting done! No excuses since I'm pretty sure that even borders are in place. I'll have to double-check that though. Unfortunately I have some rather bummer news ... Remember I was busy with a Mystery Knit-a-Long? Well, after working really hard to catch up with the clues, I discovered that I had been knitting on 2-sizes-too-large needles! UGH!!!! That certainly explains the huge piece I have going plus the loose weave! Jeezy, Peezy! 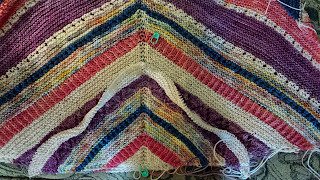 I started the 2nd triangle with the correct size and it is certainly considerable smaller with just the first few rows. I will be frogging my first piece and not worrying about catching up. There is just no way and I'd rather enjoy my knitting instead of working at break-neck speed. I also took a tatting class from our renowned tatting guild member. With all the knitting I had been doing, my fingers were pretty much locked up and not working that shuttle too good. However, I've been practicing when I could and watching YouTube videos and I must admit it seems to be getting easier. I never did learn how to connect my picots and I'm hoping that lesson will be coming up on YouTube soon. 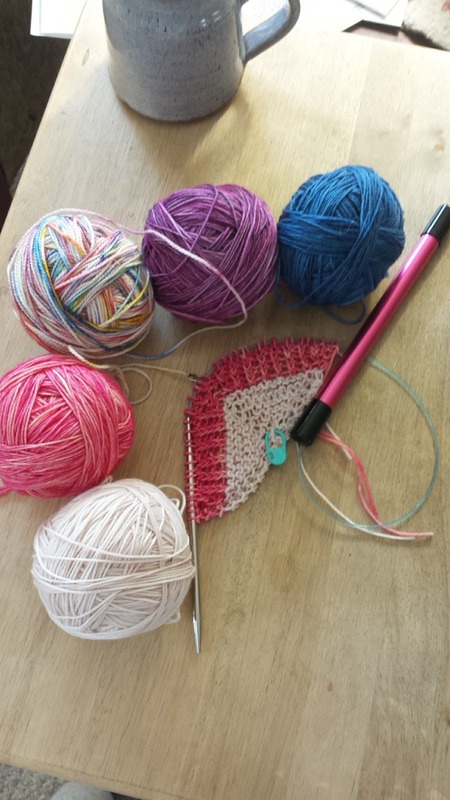 Next tatting class is June 15th! Yesterday the roofers arrived. We were hit with hail back at the beginning of March and repairs are underway. I have a simple project I'd like to start (and finish?) today to drown out the banging of the new roof. I've been enjoying the French Open Tennis so I've also got my label and clam shells on tap for handwork! 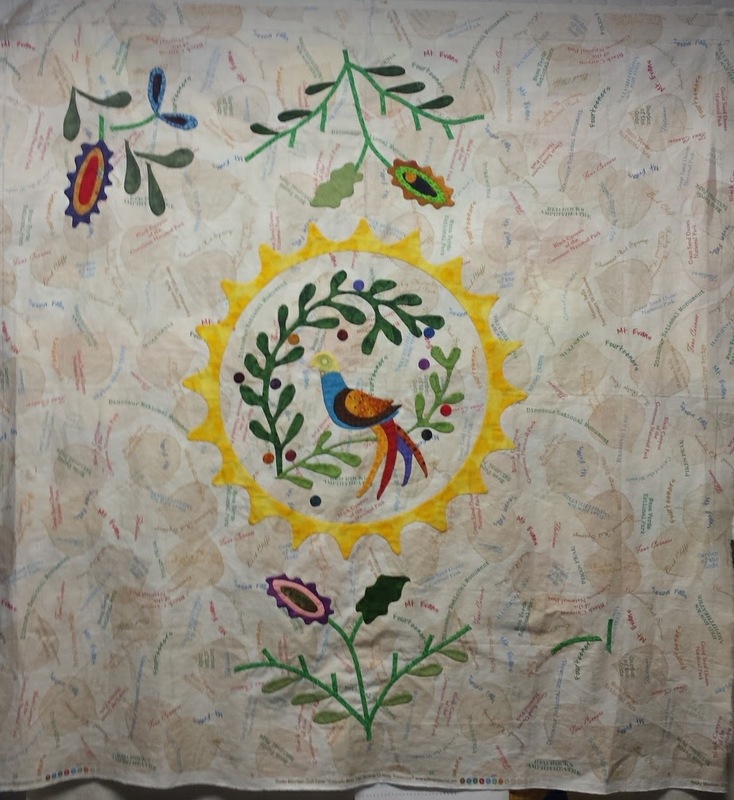 Happy stitching to all and don't forget to come to our Quilt Show June 10-11!